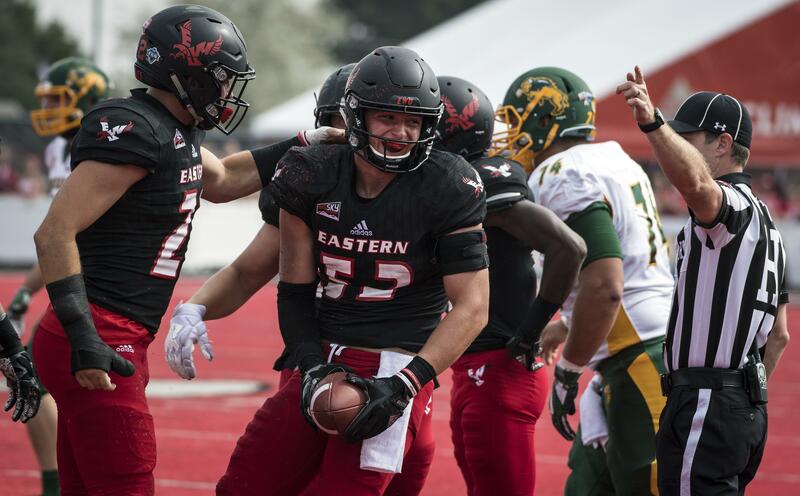 Even during a 27-point loss, the Eastern Washington defense found some things to build on Saturday afternoon. Many of them involved reserve linebacker Jack Sendelbach, who had a game-high 13 tackles and recovered two first-half fumbles to keep the Eagles in the game against North Dakota State. “It was a tough loss, but I thought the defense played well, especially in the first half,” said Sendelbach, who started for the second straight week on the strong side as Ketner Kupp recovers from an ankle injury. “We finally broke down in the second half … we got undisciplined and were trying to make the big plays,” Sendelbach said. However, Sendelbach made two big plays that kept the Eagles in the game. Early in the second quarter, NDSU was in Eagle territory at the 43. On fourth-and-1, quarterback Easton Stick lost the handle on the ball and a melee ensued. “Everyone was in a dogpile but nobody was looking at the ball, so I stuck my hand in there and got the ball,” said Sendelbach, a redshirt sophomore from Seattle. However, Eastern’s offense was unable to capitalize, going three-and-out. Midway through the second quarter and trailing 9-7, Eastern linebacker Kurt Calhoun forced a fumble by NDSU running back Lance Dunn. Sendelbach recovered at the Bison 28, and Eastern was able to turn that play into a field goal and go ahead 10-9. Published: Sept. 9, 2017, 8:11 p.m.